After spending time on the very good Volkl BMT 109, I was excited to check out the BMT 122, which features a waist width that’s more typical of mid-winter touring skis for me in Alaska. We covered the BMT 122 in the 16/17 Winter Buyer’s Guide, but this is our long-term update. After almost a full year of using the BMT 122 as a dedicated touring ski in Alaska and while traveling, I have come away quite impressed. This is the third ski that we’ve reviewed with Volkl’s V-Werks Carbon construction, and we have discussed the construction at length. The skis have an unusual look due to the “3D.Ridge Carbon Construction,” but the other skis with this construction that we’ve reviewed (the BMT 109 and the V-Werks Katana) have provided a smoother ride than expected despite the relatively light weight. Paul Forward on the Volkl V-Werks BMT 122. Despite how thin the skis are at the edges, we have not experienced any durability issues with these skis, but we still wouldn’t recommend them as a daily inbounds driver in an area with a lot of exposed rocks. Like the BMT 109, the Volkl BMT 122 has a very uniform flex, and I would describe the ski’s flex as an “8” throughout. They are among the stiffest powder touring skis I’ve used recently, being significantly stiffer than the Moment Exit World, Salomon QST 118, or Salomon MTN Lab. The flex reminds me of some of the DPS Pure Carbon skis I’ve used over the years. I started with the Marker Kingpin 10 demo binding on Volkl’s recommended line of -10 cm, I and never felt the need to adjust them fore or aft. The ski felt well balanced at this mount point regardless of the snow conditions. Like the other V-Werks skis we’ve reviewed, the BMT 122 comes with a topsheet graphic stating that it is to be mounted “only with Marker bindings.” This is due to an “H-shaped” reinforced mounting plate specifically designed to work with the Marker hole pattern. While you can find reports of people mounting with other bindings, talk to your local ski shop first if you’re considering trying to mount other bindings. To me, this is one of the greatest limitations of the BMT line. While the Kingpin is a great AT binding, many skiers may find them to be more binding than they need, and might wish for a lighter setup. While it may be possible with a clever ski tech, I wish they had a more universal mounting plate for bindings of all types. The BMT 122 is light and well balanced on the skin track. The mount point allows for very easy kick turns, even in steep, firm snow. Volkl touts their “Ice-Off” topsheet as a solution to snow accumulation (and the added weight accumulation) on the way up. Somewhat paradoxically, I’ve noticed several times on cold, sunny days that the black graphics on these skis collect and hold significantly more snow than the white parts, so I can’t say that I’ve noticed any difference in overall icing from other skis I’ve used, or from my friend’s skis and splitboards. NEXT: Powder, Chop, Crud, Etc. As always, great review. Did you use their glueless skins while touring? Also, just a heads up that the “Salomon MTN Lab” hyperlink goes to the MTN lab boot, whereas from the context it seems like you were referring to the MTN lab ski. Will Blister be putting out a full review of that ski at some point? Hi Mike, We have discussed their clueless skins in the buyers guide a few times. Overall, mixed feeling but I would not recommend them for general use. 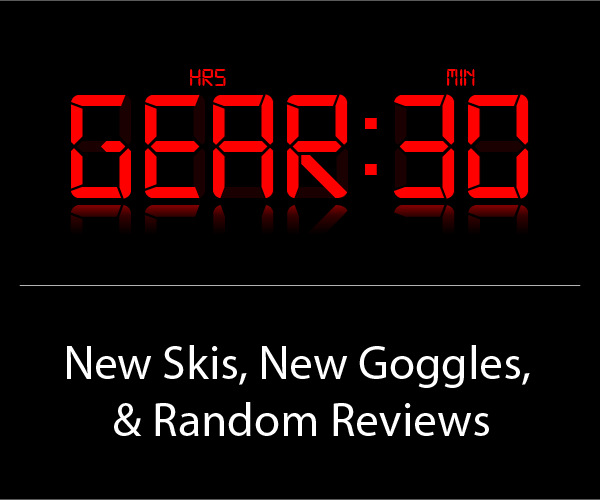 I’m not sure about a forthcoming review on the MTN Lab ski but will try to make that happen. Have long lusted after these and they are on sale now. Any thoughts on how they would work as replacements for my G3 Empire carbon 127? Main concern would be step down in length from 193 to 186. I’m 210 / 6’3″ so 186 feels like barely enough for a ski that will definitely be called on to charge as well as tuck thru tight trees. I haven’t skied the empire series so can’t provide a direct comparison. You’re a bigger guy than I am and I’m glad that the 186cm 122 isn’t any shorter. They may feel small for you. I’ve been looking at getting these as my dedicated touring set up on British Columbia. I’ve got the line on a set of these in 186 length. However, I’m a little worried 186 might be a bit long for me. I’m 5’11” 205lbs and an intermediate skier. Thoughts? Hey Trevor, I think these would suit you quite well. The 186cm 122 doesn’t feel like a big ski, especially in powder. At your size I think you’d be pretty happy. If you’re used to a much shorter ski the 186 might feel a little long I tight spots but the full rocker makes them pretty pivotable. Depending on your experience with powder skis they might also feel a little unruly in firm or cut up snow compared to a shorter, narrower ski but overall I think they’d be a great choice for what you’re describing. let us know how it goes! Marker specific binding mount seems to rule out NTN mounting. Any beta on similar ski for tele charging in the backcountry? I’ve been on the Kingswood Rocketype for the last three years and have skied the Liberty Double Helix in Niseko this season. I’ve loved the DH even though it seems a bit more surfy than I usually like. How would the BMT compare to the DH? I demoed the BMT 122 , 186 cm for 2 days in 4″ to 18″. Temp range 12-25 degrees. Day one I felt the tips loaded up a bit but overall liked the predictable way they skied. Day two it snowed 6″ more (6″-18″ total) based on store recommendation I moved the demo Kingpin toe back one setting so centerline on boot was about 1/2 centimeter behind ski center vs. day before 1/2 centimeter ahead of ski center. Completely eliminated tip loading, I had a great day. the ski made very predictable medium to long radius turns, with more aggressive leg flexing to avoid bad spots or trees it easily made a shorter radius turn. My first 2 runs the 2nd day my thieghs burned a bit but after that they were OK, I guess I adjusted to compensate by pulling my feet back some. I bot the skis. I bought the BMT 109, 186 cm last yr. and have skied it about 20-25 days. I like it but will use the bmt 122 on deeper days. I experienced the same tip loading on the 109’s so I will move the demo toe back on those to see if that eliminates tip loading. As expected the 109 ski better on groomers, especially with a slight weighted release and not over turning them. They are actually fun to ski on soft groomers. I have skins for both, but I was wondering if the 109 skins would work OK on the 122? Hi Paul – with the end of season drawing near, I am interested in taking advantage of some end of season sales on equipment. Specifically, I am looking for a pair of dedicated powder skis for heli / cat skiing, and I would like some guidance. First about me: 6’4″, 220 lbs, 47 years old, advanced / expert, west coast. (1) Volkl Katana V Werks (184) – this is my go-to ski for resorts and side country. I love almost everything about this ski within the context of how I use it. (2) Volkl Deacon 74 Pro (178) – love this ski, but it’s pretty narrow use for hardpack-y / icy groomers. (3) Volkl Twos (191) – this used to be my ski for heli / cat trips, and I thought it was fine, but was too “smeary” for me to fall in love with it. (4) Rossi Black Ops 118 (186) – i like this ski as a resort “powder” ski, but it’s mounted much too center for someone my size to enjoy in the bottomless snow you find on heli trips (see me comments in the Blister review) – way too much tip dive, even when mounted -2 of rec. (5) Rossi Super 7s – only tried on a heli trip for a day, and I did not care for these skis in deep snow – too hooky / poppy for my taste. (1) Volkl BMT 122 (186) – this is sorta where I am leaning right now. this seems like a wider and slightly longer version of the katana v werks, which i love. except: (i) i don’t think i will tour on it, so am i looking at something “too light” given how I intend to use it; and (ii) is it long enough to avoid the tip dive i hated on the black ops? (2) DPS alchemist lotus 124 spoons – honestly these were not on my radar until i started seeing the comparisons to the BMT 122s. and i see some comments that they are the “go to heli ski” for Blister (or at least Paul). my only reservation here is that this is a cambered ski, so i worry about that same “hooky / poppy” feel that i didn’t like in the Rossi Super 7 in powder. i think i might want a reverse camber ski here. but maybe my reservations are ill-founded. (3) Volkl Katana V Werks (191) – this is the same ski i have today, but longer. i love this ski, but i do worry that it may not be the best option / wide enough for heli skiing, so a guy my size might just sink, even with the extra length. (4) In a separate thread, Jonathan recommended I look at the Head Kore 117. i have the same concerns here about camber, and this ski is even narrower than the DPS, so i am not jumping on this in maybe the way i should. i’m also not sure in retrospect that i was sufficiently clear in my original post that i am looking for a dedicated heli / cat ski, so i wonder if that would have changed Jonathan’s rec. so that’s where i am. any thoughts / guidance is appreciated. after a few weeks of heli skiing on 118ish skis I finally swapped back to my Lotus 124’s today and was glad to be back on them. that extra float/support really helps in certain kinds of snow and big terrain and they’re not that much sketchier when things get firm/weird. Even with the small amount of camber the shape is really conducive to being tossed sideways when needed. I’m a obviously a big fan. I agree with most of your sentiments on the above skis. The BMT 122 is a great ski. I wonder a little if you’ll find it too short in the 186 and it’s a little light for going fast in weird snow compared to heavier skis. One other ski you should look at is the Black Crows Nocta. I had a bunch of heli guests on them today and while I still haven’t skied a pair in any meaningful way, they seem to check a lot of your boxes. I can’t wait to heli ski on a pair. hopefully soon! the last option is the limited release of the Moment Chipotle Banana. no sure if any still available but I also want to try a pair badly. Best of luck! Let us know what you settle on. Thanks Paul. I checked out out your suggestions and spoke with a few other people. I ended up going with my gut here on the BMT 122s. Ordered them with Kingpin 13s, which I have some reservations about since I will tour very little on these skis, but I figure that setup will give me the most optionality with touring. Right now my touring set up is Rossi Soul 7s with frame bindings – which is to say bad. So maybe this step-up will encourage me to enjoy the uphill more than I do today. I just hope that with my size I don’t see pre-release issues, or worse, no release issues. Will try to post more once I get on the snow, but may be next year at this point. Thanks again! What’s Blister’s opinion of the BMT 122 versus the Bent Chetler 120? Will you all do a Deep Dive on those skis? Do you know anyone who has mounted the shift mnc binding on the BMT 122s? 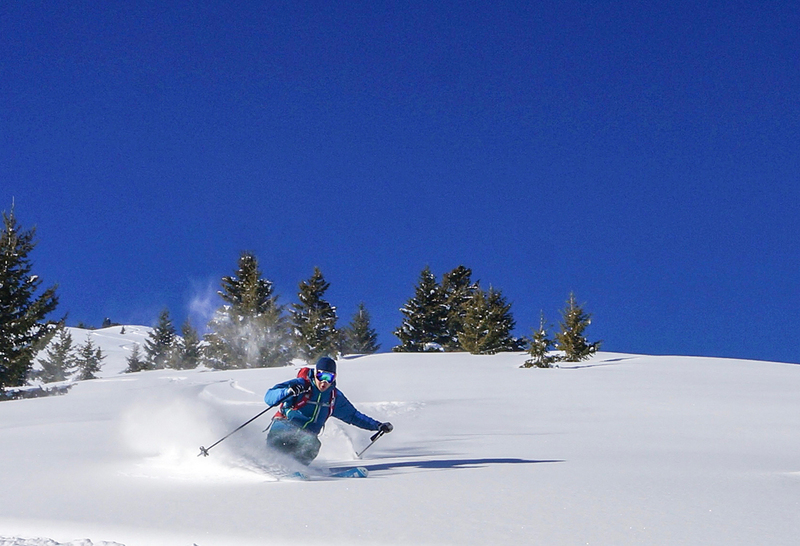 For touring on the CO Frontrange the Atomic Bent Chetler 120 is recommended in one of your two ski quiver lists. What about the BMT 122? Or would the BMT 109 be a better option due to the consistency of variable snow? Thanks! Love the great reviews!